Yes you read that right Down syndrome and marriage. Today we are thrilled to welcome Playhouse friend Paul Daugherty to our little corner of the internet. Most of you are familiar with the letter he wrote to his beautiful daughter on the day of her wedding two years ago. Read it again…we will wait…who needs a tissue? “My wife Kerry and I like to think we did nothing special for our daughter Jillian, born in 1989 with Down syndrome. We simply allowed her to define herself. She did the rest. Her special-ness is plainly apparent to us, and to all who take the time to See her, not Look at her. Anyone blessed to know a person with a disability knows the distinction. Jillian met Ryan when she was 15, and he 16. They played soccer together, in a league for kids with disabilities. One of my biggest fears was for Jillian’s social life. We could make the schools give her the education to which she was entitled. We couldn’t make her peers accept her. A childhood without birthday parties, sleepovers and Homecoming dances is no childhood at all. I feared the day Jillian understood she was different, and wanted to know why. Jillian and Ryan were bold and joyous on the soccer field. Jillian was a bit of a tomboy. Ryan had a knack for the game. Plus, his father was the coach. One early fall evening as practice was ending, Ryan stood on the side of the field opposite from the waiting parents and motioned Jillian to come over. “Do you know what Homecoming is?’’ he asked her. “I’m not very sure,’’ was her reply. She was a freshman in high school. Ryan was a sophomore. They attended different schools, both nearby. Jillian never answered. She bolted across the field, wide-eyed and happy. “I have a date, I have a date, I have a date!’’ she yelled. Poor Ryan was still on the other side of the field, wondering if she’d said yes. That was 12 years ago. In the interim, Jillian and Ryan graduated from high school and attended Northern Kentucky University for four years, each walking the graduation line. We asked them to be their own people, and we demanded that everyone else – from teachers and administrators to employers – do likewise. They dated for 10 years. I took a considerable pull on my bottle of lager. I didn’t need time, of course. The dad who worried for his daughter’s social life was floating somewhere over the moon. They invited 150 people to their wedding. Everyone there had something to do with their success. We’re only as good as the way we treat each other. We’re never better than when we seek to accept and understand those different from us. Jillian and Ryan have their own place, a two-bedroom townhouse for which they pay all the rent. A year ago, they added a dog to their family, a 1-year-old Australian spaniel they named Gracie. They shop for their own groceries, they make their own meals. They work full time, they use Uber for “Date Night’’ on Fridays. They do everything the rest of us old married people do. We take no big credit for their lives. 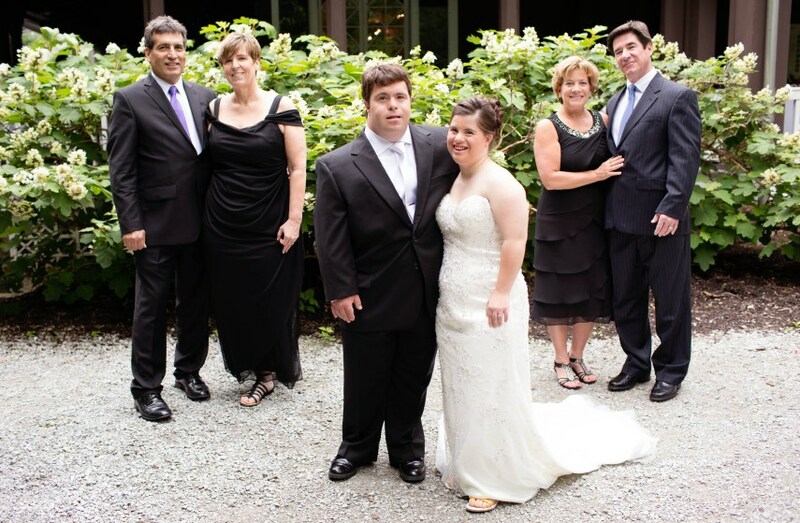 The four parents – Kerry and I, and Dimitri and Ellen Mavriplis – were of like minds when our children were born with Down syndrome, and we’ve never strayed. We expected our kids to define themselves, same as we would our “typical’’ children. We accepted nothing less: From them, from ourselves, from the world at large. They were up to the challenge. The world is getting there. The world is trying. Meantime the anniversary looms, a symbol of all that is possible when humans are allowed to seek freely their potential. Mr. and Mrs. Mavriplis have decided to stay in. Ryan’s making dinner. Jillian will provide the candles and the flowers. Paul Daugherty’s memoir about raising his daughter, An Uncomplicated Life, is available on Amazon.com and at his website, pdaugherty.com. Paul and Jillian are available for speaking engagements as well. Contact Paul via the website or at 513-313-9981. Thank you Paul and Happy Annivsary Jillian & Ryan!